The design of the new GCU-wrapped bus has gotten a lot of attention, much to the delight of one of its drivers. 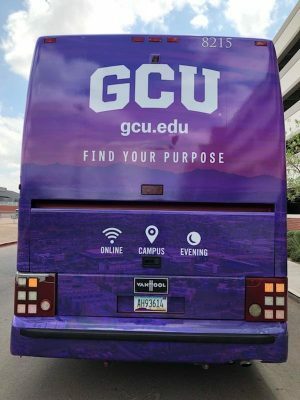 A new bus decked out in Grand Canyon University swag has hit the streets of Arizona. The bus made its first trip several weeks ago and already has tacked on more than 1,000 miles, but a different tally has driver Kenny Deitch stoked to be driving the purple motorcoach that seats 57. The back of the bus is clean and simple. 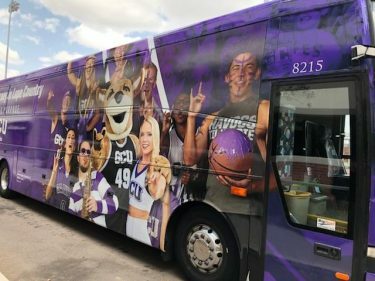 Deitch said the amount of Lopes tossed his way has made the bus one of his favorite drives in his 2 1/2 years with American Explorer Motorcoach, the company with which GCU contracts for transportation. Tyler Nelson, Associate Vice President of Ground Campus Operations, said the bus will be seen all over the state and in California as well. The bus makes mostly local runs, Nelson said, but recently had a two-day span where it went for a tour of the Grand Canyon before heading all the way down to Tucson. It goes on all sorts of calls, including tours of campus for prospective students and athletic events. Travis Schureman, Director of Operations for American Explorer Motorcoach, said he wouldn’t be surprised to see the bus make it as far as Utah. A GCU-branded motorcoach had been talked about for a few years before being approved, Schureman said. Pictures of Thunder, athletes, cheerleaders, Havocs and other GCU fans adorn the side of the bus. Phoenix-based Jomar Wraps handled the outfitting. 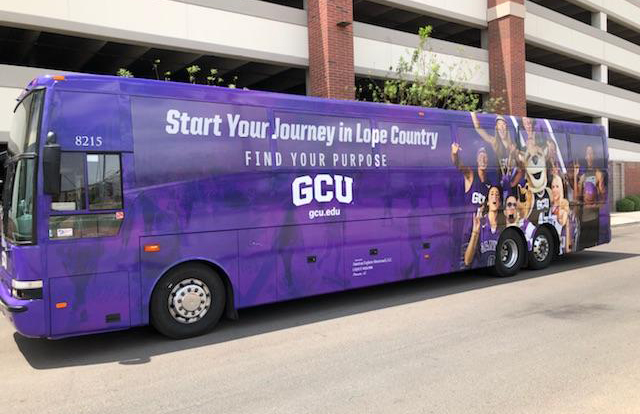 The decals read, “Start Your Journey in Lope Country,” and feature Thunder with athletes, cheerleaders, Havocs, a member of the band and fans holding their Lopes Up. GCU’s campus is shadowed in the background. The decal can last as long as 10 years if covered, or five years if not covered, Deitch said. Deitch said driving the bus has become a highlight of his job. He often gets to hang out with coaches and athletes. Deitch said he goes to the games, eats with the players and gets to know the staff on a personal level. “I basically became a part of the team,” he said. Great Story! I hope to see the bus on the road soon! Design was by Billie Worth, awesome Graphic Designer, over in the GCU Marketing Department. She killed it!